Many people would argue that this is just coincidence or an accident. Dr. Kirby Surprise tells us this is not true in his book Synchronicity: The Art Coincidence, Choice, and Unlocking Your Mind. How many times growing up did someone tell you that anything was possible if you put your mind to it? Did you roll your eyes? Can we really change outcomes or events with thought alone? Learn to use your amazing ability to create synchronistic events. Discover how your mind creates the reality you experience. Unlock your brain’s vast resources of connectivity and creativity. Change from living as a separate being to living as a part of the unified whole. Today I listened to Dr. Surprise being interviewed on my favorite podcast, Jim Harold’s The Paranormal Podcast. 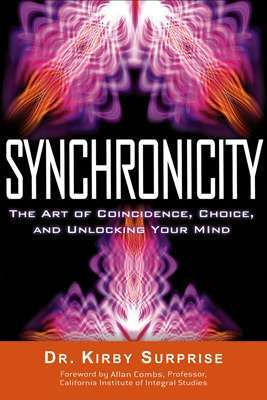 I’ve heard and read about synchronicity from various mediums and experts, but from what I heard today it seems like Dr. Surprise views things a bit differently than the average spiritualist or medium… or at least the ones I follow. He mentions being inspired by the psychiatrist Carl Jung, who was the first to propose the concept of synchronicity.